Below is the O-113 R2 and the O-113a R3 is at bottom. 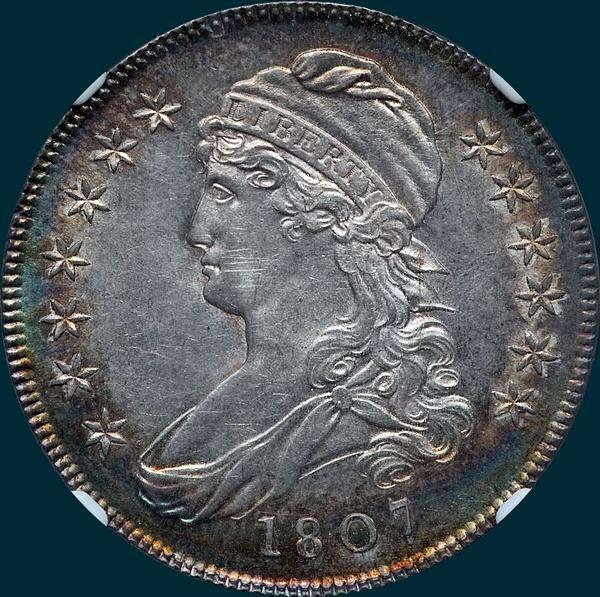 Another of the 4 Redbook varieties for 1807, making the demand high. R2 overall with the later die state supposedly an R3, but both may be R3 combined for an R2 rating. Many examples have problems of some sort, and lower grade examples are more readily available, with the higher grade XF and above 113's rather expensive. 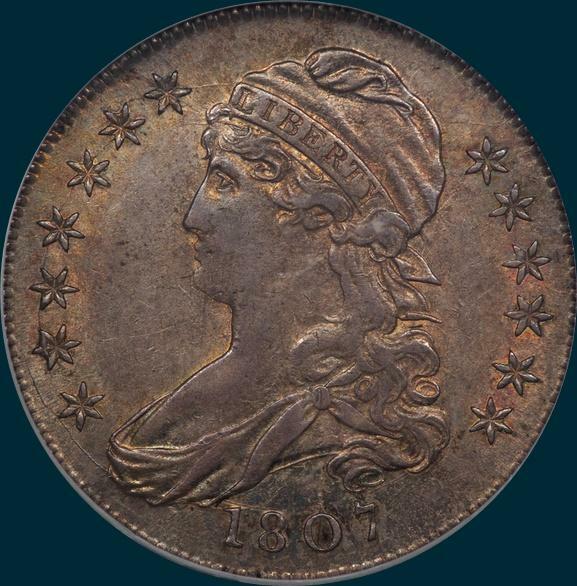 There are a couple of gems leading the pack in the census, with a handful of other lower grade MS coins in existance as well. Variety Attribution O-113 R2: Obverse-Stars are small and distant from milling. Stars are 2 3/4 mm. as compared to 3 mm. on other 1807 Turban varieties. Date is 8 mm. with slender wide spaced figures, that are quite high and distant from milling. Left base of 1 is missing. O-113a R3: Die cracks from near end of bust extending through all stars on left to front of cap. Another crack from milling through 0 in date which extends up to drapery. Reverse O-113 R2: 50 C. is a wide 4mm. 5 is small, slender and leans close to a large 0. Arrowheads are are very close but do not touch. Arrow to A is 1 1/2 mm. A center dot partly buried at inner edge of left wing causes a bump there. 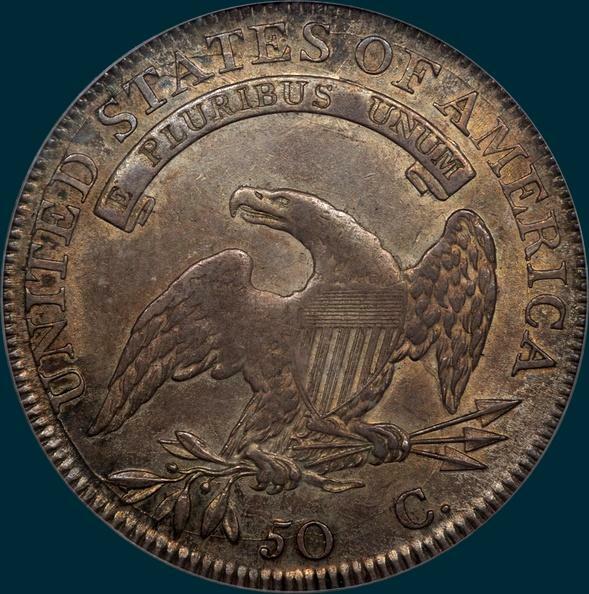 Bottom of letters in E PLURIBUS UNUM are covered with crosslines. O-113a R3: Die crack from 50 to left joining leaves, UNITED STA at top then down through TE and below S to scroll. Another crack from top of S OF AMER. 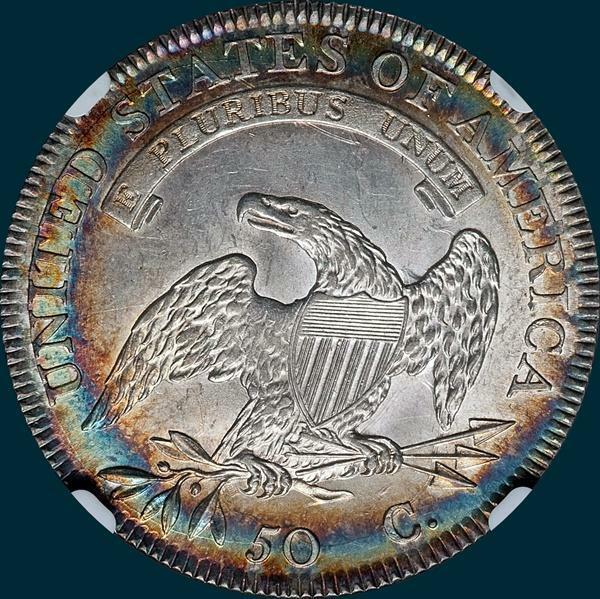 This was the 1st variety of Capped Bust Half Dollar minted in 1807 and overall.